Our students read the book of Genesis and the Epic of Gilgamesh which demonstrate that there is nothing new about sexual immorality. The Apostle Paul’s letters from the ancient world show us there is nothing new with sexual sin being a problem within the church. These articles are built upon ancient biblical wisdom but apply it to the new aspects of the internet worlds our families need to navigate. 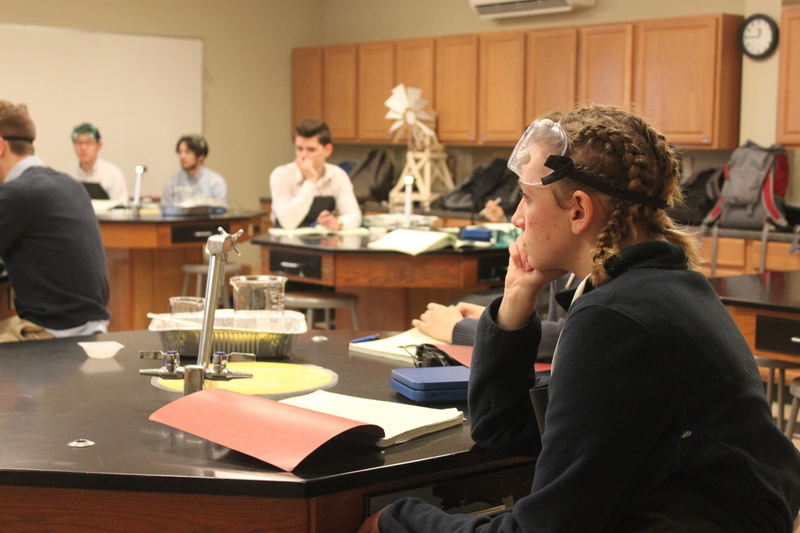 Beth Miller joined our Upper School faculty in 2017 and was recently appointed as our Lead Science Teacher. 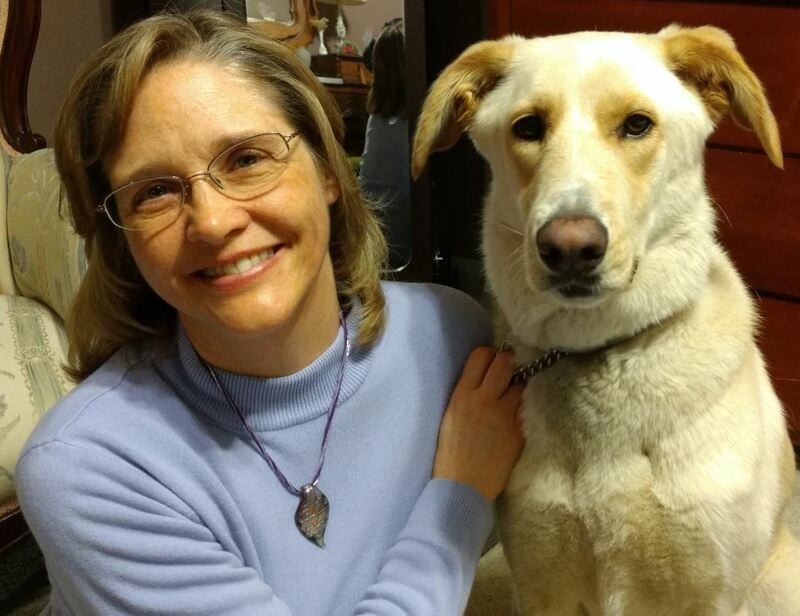 She came to Covenant with extensive experience as a teacher in homeschooling co-ops, teaching mathematics courses from Algebra through AP Calculus, and science classes such as Biology, Chemistry, and Physics. We thought that our families would enjoy getting to know her better so we have put together this profile. Rob and I have been married for 20 years. We met in college at Bucknell University where we both majored in engineering. Rob majored in civil engineering, and I majored in chemical engineering. We met through our involvement in the Christian fellowship on campus. We have 3 children: Jonathan, who is finishing up his freshman year at Drexel as a Finance major, Sarah, who is finishing up her junior year at Covenant, and Jacob, who is finishing up his 8th grade year at Covenant. What attracted you to classical, Christian education? I read a good bit about education as our children were approaching school age. I loved the idea of their education equipping them to give a reason for the hope that we profess in Christ and enable them to stand firm in their faith and not be blown about by the waves of the logic or passions of our culture. Classical Christian education seemed to be the best way to accomplish it. I particularly remember reading an essay by Dorothy Sayers and thought her descriptions of the trivium would fit well with the growth of a child. How did you get interested in science? Tell us a little bit about your educational and scientific background. I have always been fascinated by how things worked. I remember begging my parents for a computer at a young age…I’m dating myself, I guess. They were rare in households when I was in grade school. In school, I was good at math and science and my chemistry teachers in high school suggested that I combine them by pursuing a degree in Chemical Engineering. So off to college I went. Bucknell proved to be a great place to learn. It’s a liberal arts school with a great reputation for engineering which is small enough to have lots of interaction between faculty and students. For my work/study jobs, I was fortunate to be able to do chemistry research with professors the first two years, and engineering research for the last two. Senior year I wrote and defended my honors thesis on a computer model for the school’s plate distillation column. I recently went back and was able to see the bound copy in the school’s library! After graduation, I worked for Air Products and Chemicals doing process design. Basically, I was designing 5 story building sized refrigerators which we called cold boxes. Some turned natural gas into a liquid for shipping and others separated air into oxygen, nitrogen, and argon. I loved it. Most of my time was in modeling and design, but I also got to do a stint at a plant startup. A few years later, Rob and I got married, and then children came along. I began to work part time (still for Air Products) for a while and then quit to be with my kids full time. How do you think your experiences working as an engineer have contributed to your classroom experience? A lot! 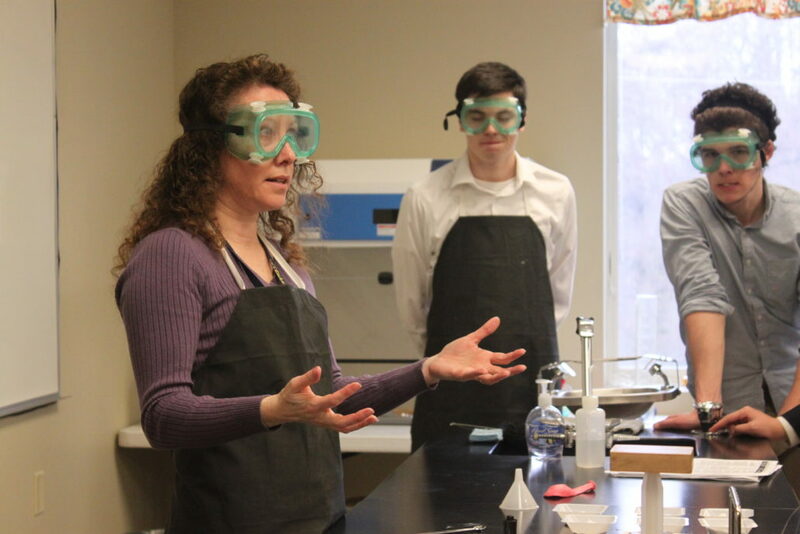 As I teach my students how to do experiments I’m mindful that their lab work has a goal…to discover things and make careful observations of God’s world. That is what research is. And all the properties that we learn about can be used to make our world better. Understanding them leads to inventions and to plants like I used to design, and, of course, cool classroom demonstrations. I am still fascinated by how things work. I want to instill in my students a curiosity about their world and a confidence that their God has hidden marvelous things for them to discover in the patterns and properties of the universe. I’m also mindful that even science people need to communicate on paper and orally. I can tell my math students that they DO have to prove their answers with work…even engineers must prove that their designs will stand up or work. No one trusts even the most senior engineer without some work to back it up. The same follows in my math and science classes. Working also provided me with some fun stories about playing with liquid nitrogen. 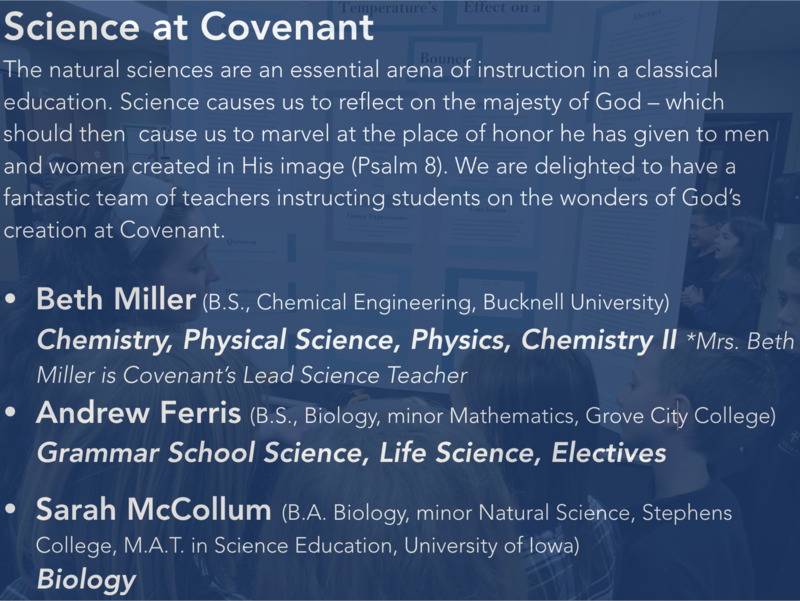 How were you involved in classical Christian education before coming to Covenant? As I homeschooled my children, it became clear that for me to give them the kind of education I wanted I would have to partner with other families. Memorization is much more fun with other kids, and dialectic and rhetorical skills require that you have other people to bounce ideas off of. Also, there were some subjects that I needed help with (history is in the forefront of those!). So I started 2 different homeschool co-ops both of which were classical, Christian education co-ops. I directed the one which focused on grammar school for 8 years and was part of the managing board for the second after that. It made me look around to see what was possible for my kids. I was blessed to partner with some great people who helped me educate my children. In addition to being the Director of the Upper School there, I developed the science program for the 2nd-12th grade years and taught the upper school classes in Physical Science, Biology, Chemistry, and Physics…along with some Latin, math games, and SAT math prep. I loved watching the students grow as they came through the program. And I loved sharing my love for science with them. In your opinion, what place should the sciences have in a classical, Christian education? Although science is not the first thing you think of when you hear the words of the trivium: grammar, dialectic, and rhetoric, it provides a great vehicle for practicing those skills. Science is part of the wonder that we want to instill in the grammar school children…wonder at the amazing world God has designed. Logic is one of the hall marks of good science. Writing lab reports gives students a good opportunity to practice collecting data and proving what they claim to be true. Part of logic is understanding causes and effects, and again, science provides a perfect place to practice logic where questions starting with how and why help ferret out their understanding. Why does the pressure of a gas increase when the volume is decreased? How can the force of an impact be decreased? A good science class is full of opportunities to practice thinking well. Ernest Rutherford of the gold-foil experiment fame said (and I’m paraphrasing) that your scientific discovery was of no use if you could not explain it to a barmaid…which was his way of saying that knowing a thing was not much use if you could not communicate it to someone else; hence rhetoric is important. Also, science is part of our world whether we know it or not. We want students who can think through which treatment for a medical condition would be best for them, or how to save money on their heating bills. They need to be able to discern if the person on the infomercial is peddling science or fish oil. We need students who can be a persuasive voice for ethical science which honors God. This means they need to understand science. Finally, though the trivium does not include words that speak exclusively of science, looking further in classical education to the quadrivium (arithmetic, music, geometry, and astronomy) does. It shows that classical educators were interested not just in science…but good cutting-edge science. Astronomy in the Middle Ages would have been like studying astro-physics or semi-conductor computer chips today. I would go so far as to say that science does not just have A place in classical, Christian education, but that it has an IMPORTANT place there. It trains our minds to think carefully and wonder greatly. I want my students to be able to say that they see the world differently after taking my classes. As a somewhat new member of our community, what are some of the things that stand out to you about Covenant? I have loved getting to know the people of Covenant. It is a wonderful place for me to work and for my kids to learn. One of the things I love is the rhythms that are knitted into the day to remind us of what is important: Loving God and honoring him with our time and talents. We do this in the Upper School through the morning Matins, praying and singing after lunch and again at the end of the academic day. I’ve loved seeing the care and thought that has gone into preparing the students to write and speak well and hearing about the discussions that my own children are having in their classes. There are some wonderful faculty members whom I am so thankful my children have the opportunity to learn from…who will inspire them to think about God’s world and what has happened in it. That doesn’t mean it is easy…but that it is shaping them into being those people that I talked about before who can give an answer for the hope that they have and discern the good from the bad in the winds that blow through our culture. I’m proud to be a part of it and have found several kindred spirits here. I’ve also been humbled by how much the parents contribute to the school. I’m so thankful to be in a place where MANY people are working to make Covenant a great place to learn. I’ve also been having fun with all the toys in my lab! For someone who carefully purchased each piece of science equipment needed for my previous classes, it has been great fun to have such a well-stocked lab to work with. I have burettes, beakers, flasks, and pipettes aplenty. What would you want your future students to know about your classes? Hmmm…good question. I want my students to know that my classes are hard and that they are fun. And that I care about them. I want the students that have come through to tell those who are coming that the work is hard…the math can be difficult. But there are flying pigs to watch, raw eggs to toss, crash bumpers and airbags to design, soda cans to crush with atmospheric pressure, and dollar bills that are NOT consumed by flames. Because though science is hard…it is also fun. When you’re not teaching at Covenant, what are some of your favorite things to do? When I’m not teaching at Covenant, I enjoy being with my family. Taking my kids to their events and cheering them on is my mainstay. I also enjoy Boggle with Friends, and Sudoku (because…math and logic of course, but only the REALLY hard ones), and watching a good detective show with my husband. Thank you for so faithfully teaching our students about God’s creation, Mrs. Miller! We so appreciate you. 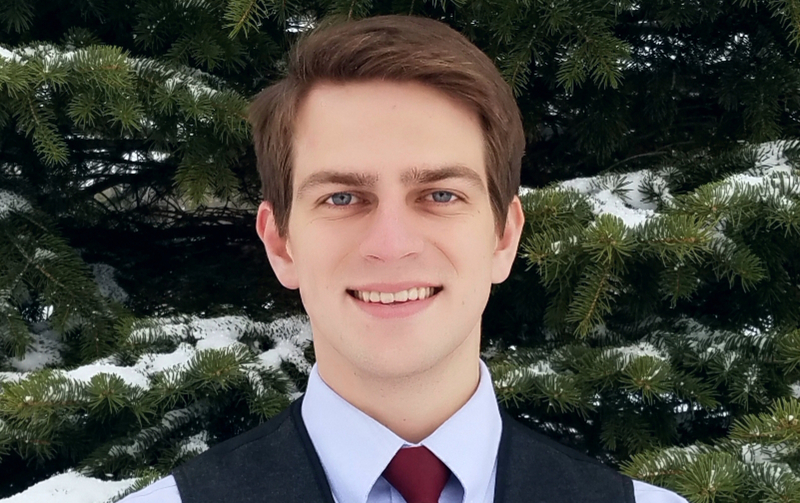 Covenant recently hired Andrew Ferris as a new math and science teacher for 2018-19. 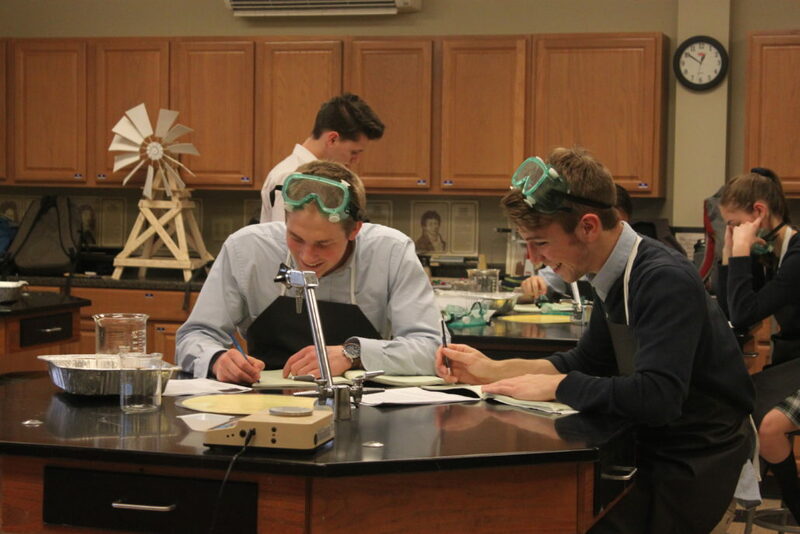 Andrew will be teaching our grammar school science classes as well as Life Science and math in the upper school. 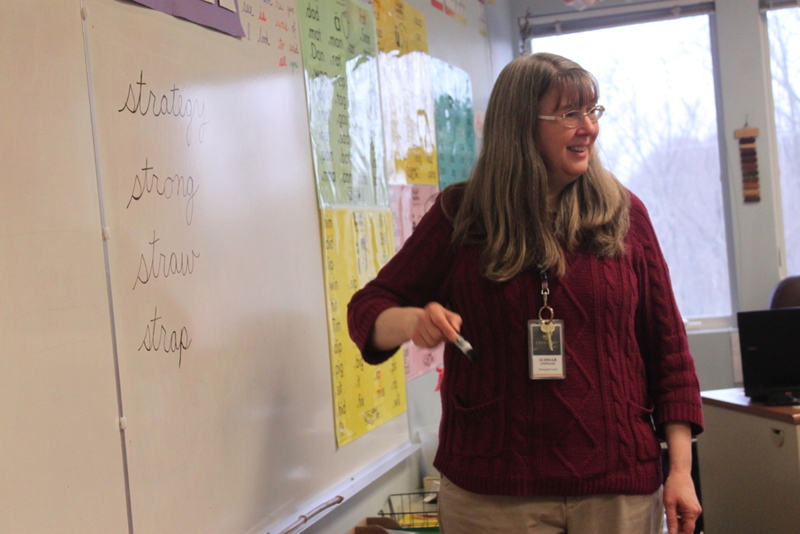 He is also well equipped to teach an upper level math or science elective as the need arises. We are blessed that Mr. Ferris is able to spend the month of May at Covenant so that he can begin to get to know students and families in our community and to prepare for teaching this fall. Tell us about your family? Where did you grow up? I am the middle of three boys. I grew up with my parents and brothers in Chardon, Ohio, which is famous for its excessive snowfall and maple syrup industry. I attended Grove City College. I majored in Biology, with a minor in Mathematics. What are one or two books you’ve read this last year? What did you learn? Most recently, I finished reading The Weight of Glory and Other Addresses, which is a compilation of several addresses given by C.S. Lewis. Lewis’s works consistently deepen my longing for God and point me to the understanding that every desire of man can find ultimate satisfaction in God. I also recently finished reading Every Good Endeavor by Timothy Keller. This book helped me better understand how we as Christians ought to approach our work, and how work is one of the ways that man can glorify God and be His image-bearer. What have you been doing since you graduated from college? Since graduating in December 2016, I have been working in the Bioanalytical Chemistry department at Concord Biosciences. I work in the laboratory, performing experiments on drug compounds that are in various stages of development. How do you think your experience as a scientist will impact your teaching? I think that my experience as a scientist gives me a more in-depth scientific knowledge, especially in the fields of biology and chemistry, and has enabled me to see first-hand how the ideas that I learned when I was in school are applied in real laboratories. This allows me to teach from experience, not merely from head-knowledge. Also, the laboratory is a diverse workplace, made up of very different people from all over the world who have very different worldviews and values. This is very useful in understanding how different worldviews approach science, and the implications and consequences of the various mindsets. This will help me to point my students toward a proper understanding of science, which I believe will serve to increase both their knowledge and their joy in science. Who have been some of the biggest influences on your thinking – either in person or through books? Two professors from Grove City College immediately come to mind: Dr. Paul Munson and Dr. Julie Möller. The lessons from both of these professors, whether inside or outside the classroom, are saturated with God’s truth, ever pointing me to the Source of all wisdom. Additionally, I very much enjoy reading and learning from the works of C.S. Lewis. What do you most want young grammar school students to learn through your science classes? I want the young grammar school students to learn how God has given us such a good and glorious creation, by which we can praise Him. I want the study of Creation to fill them with an awe for God and a desire to continue learning more and more about it. 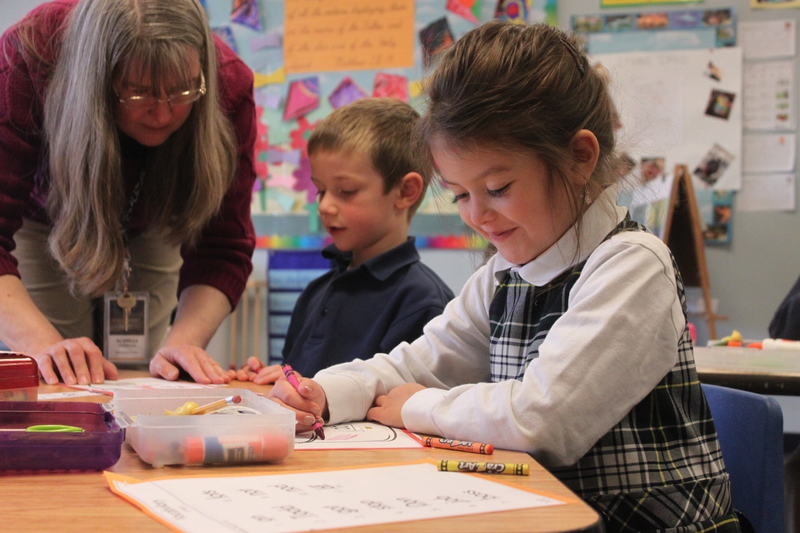 What are you excited about when you think about teaching upper school students at Covenant? 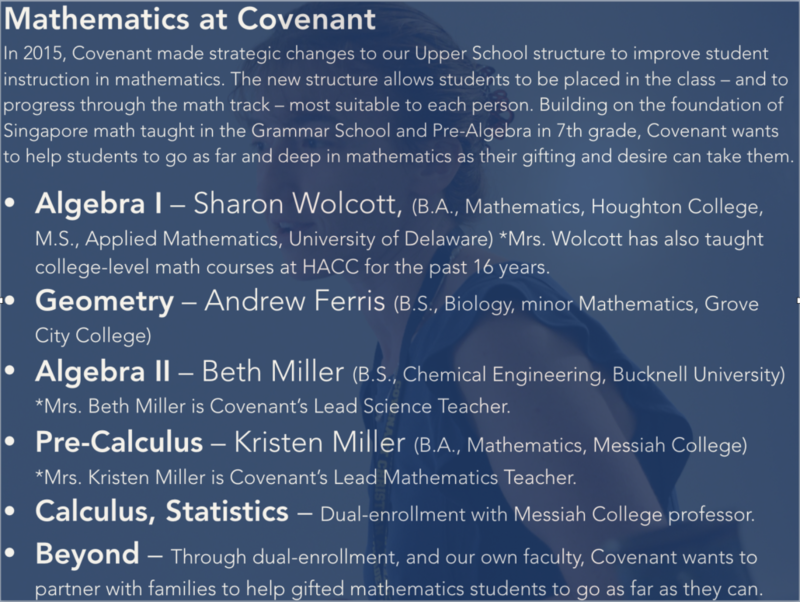 I am excited for the opportunity to help the upper school students get glimpses of God’s glory through the studies of math and science. I am excited to help my students understand how we as Christians ought to approach the fields of math and science, regardless of the career paths they pursue. I hope that through their studies they would not only be knowledgeable but also have a lifelong appreciation of the beauty and purpose that God has infused into His creation. I enjoy partaking in good conversations, playing piano and French horn, composing music, fishing, making and throwing boomerangs, kayaking, hiking, ballroom dancing, playing volleyball, playing chess, making maple syrup and gardening. While many of our families were enjoying spring break by relaxing, traveling, and resting, one of Covenant’s faculty members – David Kemper – along with a cohort of student and parent helpers, was busy performing one of the biggest annual transformations that Covenant experiences: the building of the set for our drama production. Mr. Kemper teaches history, literature, and rhetoric, and serves as Covenant’s lead teacher of classical pedagogy. He is also the Director of our drama production. 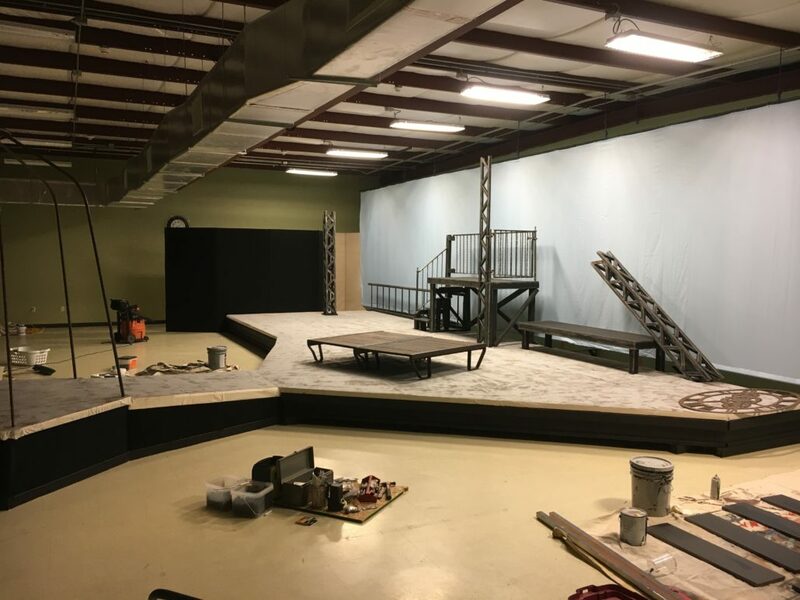 He and his team of helpers built a gorgeous set for this year’s production of Romeo and Juliet – working over spring break every day except Sunday, from morning to night, to get it done. The play promises to be excellent – so buy your ticket and come and join us for one of the shows beginning on April 19. 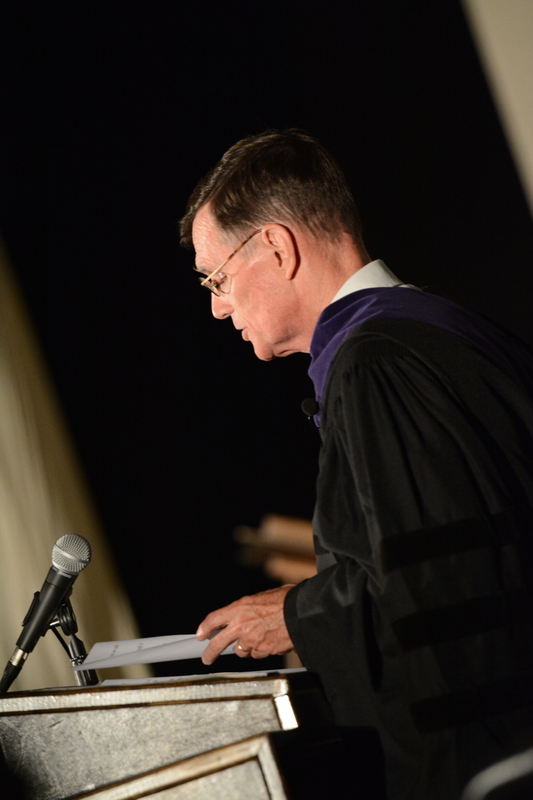 We recently asked Mr. Kemper to provide some insight into his Director role. How long have you been directing plays at Covenant? This is my fourth year directing plays at Covenant. What are the shows that you have directed or been involved in? Hamlet was the first play I directed, then Arsenic and Old Lace, The Imaginary Invalid, and now Romeo and Juliet. Before that, I’ve been involved with most of the plays in some role or another. My first set design and construction was Antigone performed in the Parmers’ home theater in 2004. Since then I’ve designed a few sets and mentored student directors from Messiah College who came in to work with our students. 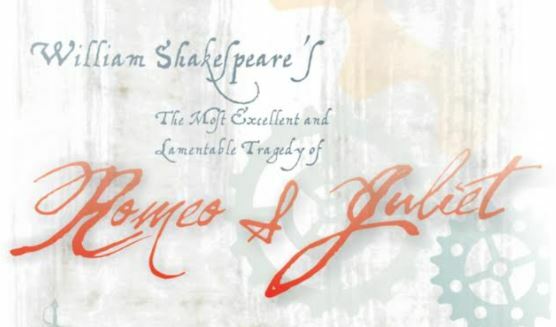 Why did you choose to do Romeo & Juliet this year? Selecting Romeo and Juliet as this year’s play was a group effort. We have a tradition of performing a Shakespeare play every few years, and I think Mr. Hayward suggested it might be time again to do a drama. I settled on Romeo and Juliet, pitched it to students, faculty and administration and it stuck. Do you have a favorite line or lines from this play? “What early tongue so sweet saluteth me? Aside from the characters, what are other roles that students perform to make a drama production? I try to involve students in most of the stages of production. 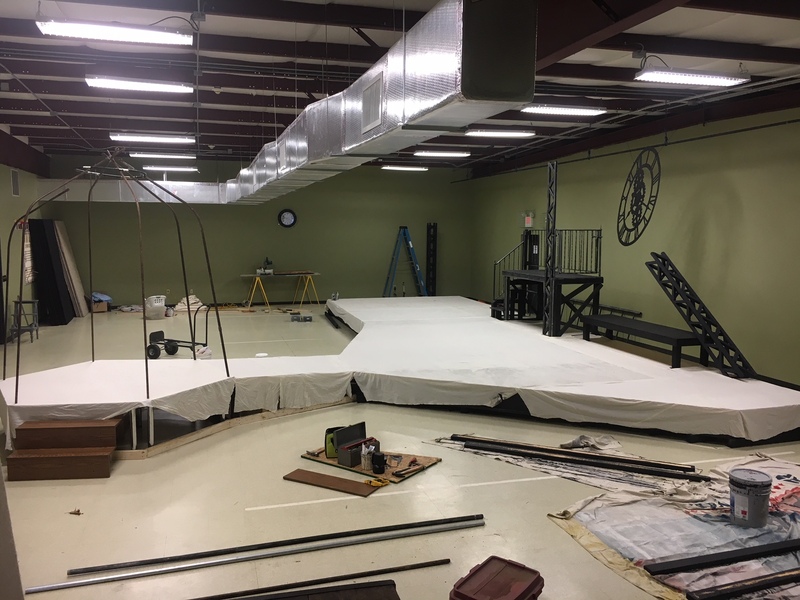 From creative vision to acting coaching/direction to set construction and costume design/acquisition, facility management, lighting looks, sound vision, make-up concepts, prop management, actor support, audience care, … really just about every part of what it takes to give a community a full and successful performance. How did you come up with the idea for the set? My favorite sets have been the more abstract sets I’ve seen… ones that communicate a theme or inspiration from the script, but that don’t explicitly describe this or that scene. In Romeo and Juliet, the script calls for a balcony. It calls for a bed, a burial chamber. I think a good designer can think of ways to make pieces of the set become all sorts of different items based on how they’re used. That way there doesn’t need to be scene changes with various painted back-drops to tell the audience where they are. This can be done more abstractly with minimal set cues and lighting and audio. Our balcony is the remnant of a broken clock tower. Shakespeare has something to say about time improperly managed as a tertiary theme beneath love and vengeance. The idea is to engage the audience in a way that leaves space for their minds to fully imagine that what they are seeing is really happening in front of them. Tell them too much, and they feel separate from the art. Tell them just enough, and they feel like a part of it. 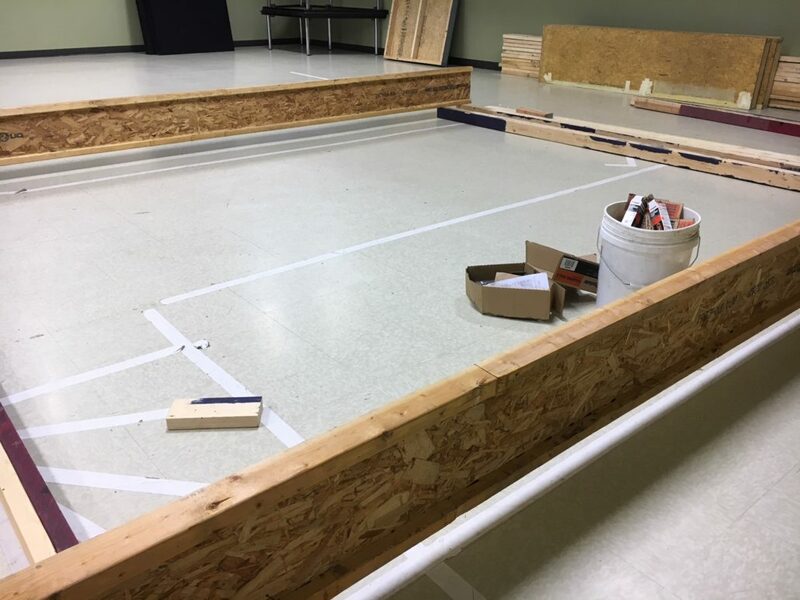 The construction of the set takes a lot of help. From materials, donations/purchases, and trucks/trailers to haul those materials, to hands to carry and cut and assemble, again, every volunteer, student, and parent is a valued contributor! What are some of the things that you’ve seen students learn from being a part of a drama production? By participating in the play, whether acting or in some of the other ways mentioned above, students learn to value interdependence. Not only do they experience the feelings of triumph after a great performance (a valuable sensation). Students become emotionally linked to one another. I suppose it’s similar to students who work hard together on the soccer field. In team sports, success isn’t determined by one player. I think this is also true for a successful theatrical performance. The lead actors might have more lines, but if the lights don’t come up, who would see them delivered? If the supporting cast member doesn’t cue their entrance by carrying the right prop, how would a sword fight commence? Students learn to depend on each other in sometimes challenging but achievable ways. They really can count on their cast mates and technical crew and directors. Take us through what all goes into this. When do you select the play? What work do you do to the script? When do auditions occur? Who are some of your non-student helpers? How often are rehearsals? After the play is selected I do multiple reads of the script taking into account my pool of actors, facility strengths, the sensitivities of our diverse audience, and then begin to edit/alter/shape the script in small ways. This is necessary with Shakespeare since there are just some lines that are too bawdy for our student-actors and our audience. We then schedule the auditions depending on what kind of work I think actors will need to put into memorizing their lines. This theater season, we held auditions before Christmas, to ensure that leads would have a script in their hands over break. During this time, a production team of a couple parents and faculty begin emailing back and forth generating ideas, schedules, and parent volunteers and more schedules and timelines. Without the help of Erica Bryce, Val McClymont, and Teresa Lanza very little of this year’s production would have come together. It really is just too much for one person to carry. Having a strong team of passionate and driven friends is essential for our dramas to come together. I’m so thankful for these ladies and their committed involvement. I develop a schedule by splitting the script into manageable pieces and trying to take into account any schedule conflicts. We like to start rehearsals after basketball season is over for example, and sometimes I’m able to accommodate work schedules or family activities for students who request flexibility. All that considered we do try to rehearse every day up till the performances… except for Easter break and most weekends. Well, it is a lot of work… and I reevaluate if I’m able to commit to all of it every year. Again, without the team that crowds around me to support and manage so much of the process, it just wouldn’t happen. There are so many that I don’t have room to mention, but aren’t valued or loved any less than those I have. I sleep just fine, I guess… I’m smiling as I write this. The thing is, I might sleep more restfully if I worked from lists, but I don’t. I can recount stories of how I awake from a dream in the early morning hours with solutions to one or more of the problems I hadn’t yet thought out. Or sometimes I dream in a particular character’s point of view, as I work out motivations or movements to better direct the student actors. But yeah, I sleep. How do you recover when it’s all over? The process of taking it all apart when it’s over is a cathartic way to recover from the process of building it all. That is, partaking in conversations afterwards, hearing how the play impacted viewers, hearing how the actors have moved back into normal schedules and where their heads are, physically demoing the set, trying to return all the props and set pieces and costumes that were loaned to us or rented… in a sense just returning to normalcy and a satisfied rest, like returning home after a strenuous hike. I remember the vistas, and the taste of the streams, and in all seriousness, sometimes I weep. In your opinion, how does the theater enhance a student’s education? Theater is just one of the many ways a student is best educated. It is frivolous. It is pretend. But it is also essential and real. 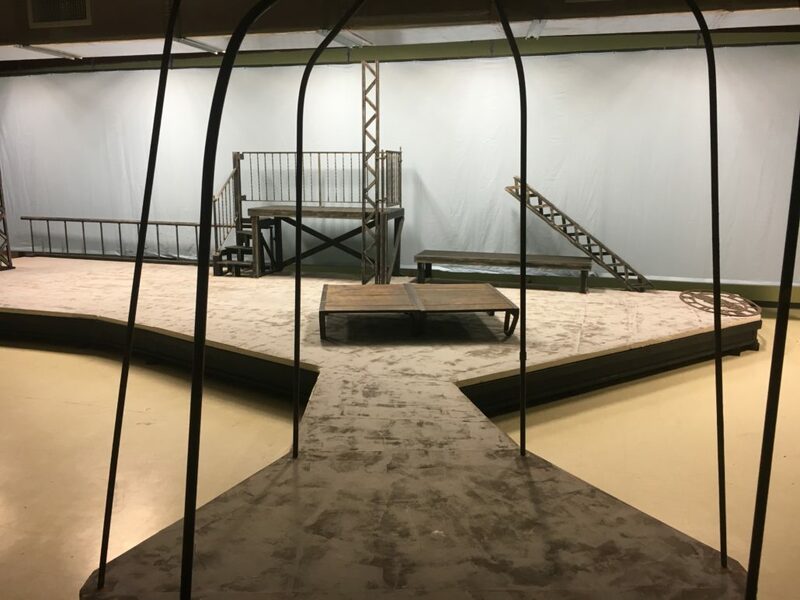 Theater might only be an echo of reality in terms of actors and characters and pretend spaces, but theater directs a student toward discovery in a way that offers new insights on the world and people around them. Theater is simply literature for the stage, bringing life to old words, old themes. When young people do theater, old things become new… for them, and for us.